Whether you’re a baby boomer, millennial, or anything in between (we’re talking to you, gen Xers), your internet connection is probably more than just a modern convenience. It’s a practical necessity. In fact, your access to internet—or lack thereof—has a direct impact on how you live your life and your potential for success, both in school and throughout your career. In a recent study by the Center for Urban and Regional Affairs, they found that one to three broadband providers in any given area can boost the employment growth rate by 6.4%.1 Pretty impressive, huh? Yet, even with all this statistical data, there are still some Americans (primarily in rural areas) who don’t have reliable access to internet—despite the efforts of many state governments to bridge the connectivity gap. That’s why we decided to do some research, mine some data, and determine which states are leading the charge when it comes to bringing high-speed internet to the rural masses. 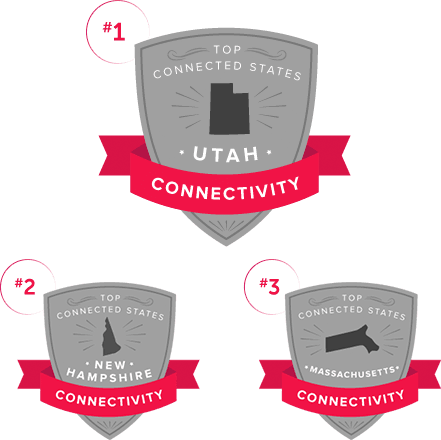 The top 10 states showing excellent connectivity to broadband all value connecting rural citizens to the resources they need to succeed economically, both in school and at work. The top state on our list? Utah. Taking cues from Silicon Valley—and home to big tech companies like Adobe, Vivint, and eBay—the Beehive State boasts a high millennial age population and a greater-than-average median income of $66,258 per year.2,3 Utah is also one of the few places in the nation with access to Google Fiber. New Hampshire boasts the highest median household income in the nation, while Maryland has the 3rd highest, which could play into why they value broadband access so highly.3 Connectivity signals better access and more economic growth. And Oregon has made an emphasis on bridging the digital divide gap by rigorously advocating for Google Fiber in their state. Overall we found that the most important factor in these states’ ability to connect rural citizens to the internet were the use of government funded broadband task forces, infrastructure maintenance, and local support. The states that listened to the community were more likely to connect them to proper resources and economic growth flourished. Rural areas in these states have the advantage of proximity to Ivy League schools like Harvard, Columbia, Princeton, and Yale. 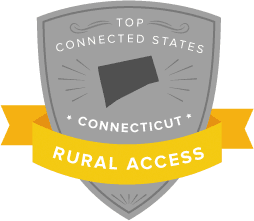 Perhaps the emphasis on education and communication makes it easier to access the internet as a student, even in a rural area like Connecticut. Typically, studies have shown that areas with one to three broadband providers experience a 6.4% higher employment growth rate and a 2.4% increase in the population than the areas without broadband.1 In the case of these states, it seems that broadband access in schools leads to a better economy. Typically, smaller states tend to have an easier time reaching all their citizens, but the states showing the fastest speeds in remote areas have done a great job at reaching rural populations. Correlations can be made for the rise of people who run an at-home business or do freelance work to make a living. Speed is critical when it comes to maintaining a reliable connection with your employer. The relative proximity to New York City may account for rural access for telecommuters. A main reason why people don’t have access to broadband internet is due to a lack of income. A Pew Research poll found that 23% of people making under $30k per year don’t use the internet, possibly because of the high price for something they don’t consider a basic need. Most rural schools still lack access to fiber and pay more than twice as much for bandwidth. In contrast, Minnesota, New Hampshire, Oregon, and Maryland all have state government broadband task forces which promote the expansion of internet access throughout their rural areas.8 They also develop action plans to identify disparities in access and ensure that homes and schools have access to the tech resources they might need. Our team of technology experts analyzed four metrics, including best speed per state, best broadband access for rural citizens per state, best measure of support in each state, and an overall ranking which combines all factors.